Naturalist Charles Darwin referred to Lord Kelvin as being 'like an odious spectre'. Kelvin opposed Darwin's views on natural selection, on the grounds that the Earth was too young for natural selection to have occurred. Working to install telegraph cables under the Atlantic. 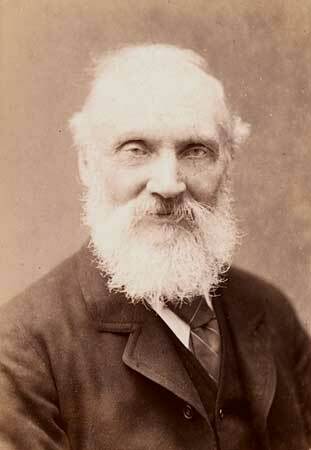 Lord Kelvin (William Thomson) was an eminent physicist with a wide range of interests and enthusiasms. Best remembered for his talent for theoretical mathematics, he also had a practical ability for solving problems. Thanks to his persistence and ingenuity, the first telegraph cable was successfully installed under the Atlantic Ocean. William Thomson was born at 21-25 College Square East in Belfast in 1824. This location was later home to the first cinema in Belfast – 'the Kelvin'. 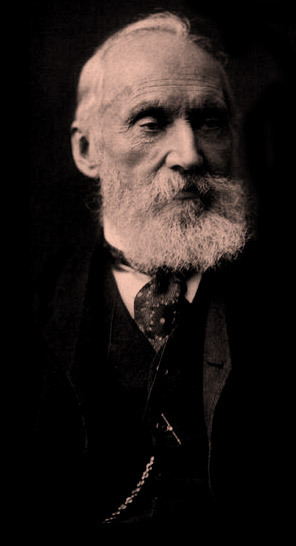 Lord Kelvin's father became Professor of Mathematics at Glasgow University. Kelvin attended university classes from the age of 10. He wrote his first scientific paper, under the pseudonym 'PQR', aged only 16. In his teens he learned French well enough to read the work of eminent French mathematician Jean Baptiste Joseph Fourier. Philip Kelland, Professor of Mathematics at Edinburgh University, had criticised Fourier's work on the theory of heat. Kelvin boldly stated that Kelland was wrong – and later scientists agreed with him. From 1841 to 1845 Kelvin attended Cambridge University. He was an excellent student – although he shocked his father by spending his allowance on a boat. After graduating, Kelvin worked in a Paris laboratory with physics professor Victor Regnault. Kelvin was influenced by the mathematical ideas of George Green, a self-taught miller's son from Nottingham. He later brought an essay of Green's to the attention of fellow mathematicians and physicists by republishing it in a respected scientific journal. Until then the essay on mathematical analysis, electricity and magnetism had gone largely unnoticed. In 1846, aged only 22, Kelvin returned to Glasgow to become Professor of Natural Philosophy. He remained in this post for 53 years. Keen to see students involved in practical experiment, he established what became the first university physics laboratory. Kelvin continued to study the nature of heat. He realised that it would be useful to be able to define extremely low temperatures precisely. In 1848, he proposed an absolute temperature scale, now called 'the Kelvin scale'. After further research, Kelvin formulated the second law of thermodynamics. This states that heat will not flow from a colder to a hotter body. His interest in the transmission of electricity prompted Kelvin's appointment as Director of the Atlantic Telegraph Company in 1856. The company was to install a telegraph cable under the Atlantic Ocean. Atlantic Cable Expeditions in 1857, 1858 and 1865 failed, but communication by cable finally succeeded in 1866. Kelvin received a knighthood for his efforts in this project. 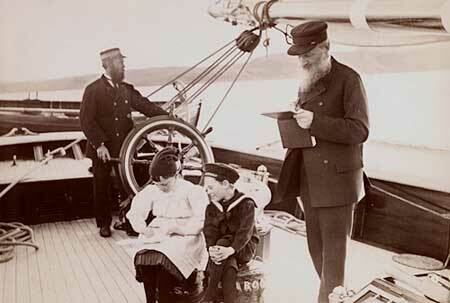 From 1870 onwards, Kelvin spent many summers on his yacht 'Lalla Rookh', and invented several marine instruments to improve navigation and safety. He introduced a mariner's compass more accurate than any other in existence, and a machine to predict tide levels worldwide. In 1884 Kelvin travelled to the United States to give a series of lectures. These were enthusiastically received, and were published in 1904 as the 'Baltimore Lectures'. Kelvin became a Lord in 1892 and took the name Kelvin because of his Glasgow connections. By the time of his death in 1907, he was an international celebrity, widely respected and honoured.